Ex-Ally Of N.J. Gov. Chris Christie Pleads Guilty In Bridge Closures Scandal : The Two-Way Former Port Authority official David Wildstein pleaded guilty to two counts of conspiracy in the "Bridgegate" scandal. Also, a grand jury unsealed indictments against two other former Christie aides. 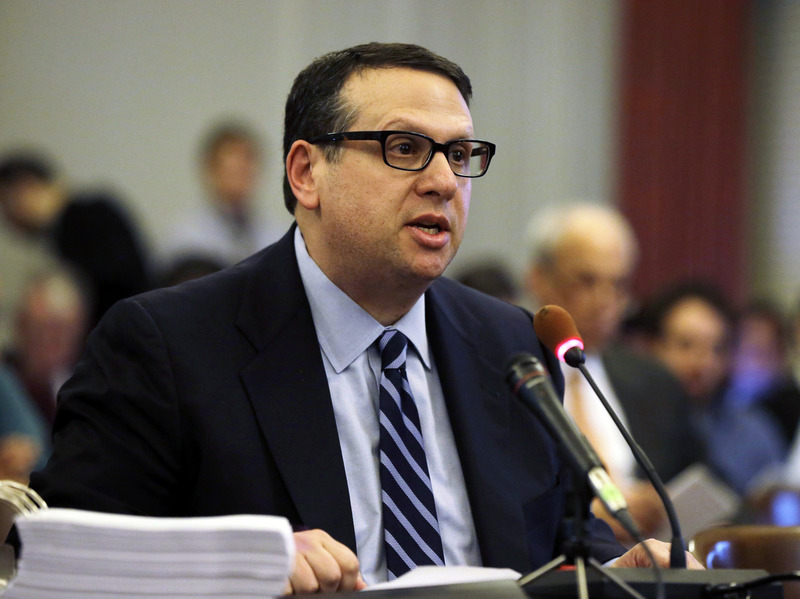 David Wildstein speaks during a hearing at the Statehouse in Trenton, N.J., on Jan. 9, 2014. He pleaded guilty Friday to two counts of conspiracy in the "Bridgegate" case. David Wildstein, a former official at the Port Authority of New York and New Jersey, pleaded guilty Friday to two counts of conspiracy in connection with lane closures on the George Washington Bridge in 2013. The case could have implications for his former friend New Jersey Gov. Chris Christie, a likely Republican presidential candidate. Indictments in April against two other officials linked to the scandal were unsealed today. Wildstein did not implicate the New Jersey governor in the scheme to help engineer traffic jams on the bridge and then covering up those actions along with two other officials. He was released on a $100,000 bond. "Wildstein told the judge he conspired with Bridget Anne Kelly and Bill Baroni to close the lanes in order to punish the mayor of Fort Lee for not endorsing the re-election of Christie." Also Friday, a grand jury unsealed indictments against Kelly, Christie's former deputy chief of staff, and Baroni, the former deputy executive director of the Port Authority. Each was charged with nine counts, including conspiracy against civil rights. You can read the indictments here. Michael Baldassare, a lawyer for Baroni, called Wildstein a "habitual liar." That view was echoed by Kelly at a news conference at her attorney's office. "I am not a liar," she said. "And I have never lied to anyone about the George Washington Bridge." Her attorney, Michael Critchley, said: Kelly is "not falling on her sword for anyone and she's not going to be a scapegoat for anyone also." At issue is the apparently politically motivated closure in September 2013 of two of the three access lanes to the George Washington Bridge in Fort Lee, N.J. The scandal became known as "Bridgegate." At a subsequent news conference, U.S. Attorney for New Jersey Paul Fishman called the plan to shut the lanes on the bridge a "calculated scheme" and a "political vendetta" against the Fort Lee mayor. An investigation by the New Jersey Legislature cleared Christie, but noted that the governor's aides acted with "perceived impunity." Christie has denied any knowledge of the closures. "The simmering scandal erupted a year ago when an email from ... Kelly, to ... Wildstein ... was revealed. It read, 'Time for some traffic problems in Fort Lee.' Wildstein's reply was, 'Got it.' By the time that email was made public, Wildstein had already resigned, as had ... Baroni .... The governor fired Kelly and cut ties with Bill Stepien, his two-time campaign manager, amid the scandal."